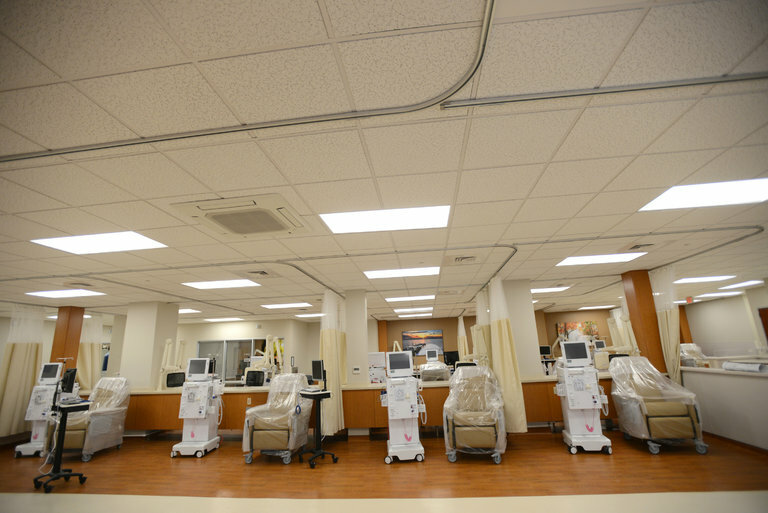 A dialysis center in Paterson, N.J. Illnesses like renal failure often prove terminal, yet their uncertain progression can make it hard for patients and their families to start the conversation about palliative care and hospice. Her last conversation should not have been with me. I’d just arrived for the night shift in the I.C.U. when her breathing quickened. I didn’t know much about the patient, and the little I did know wasn’t good: She had cancer. Her lungs were filled with fluid. As her breathing deteriorated and her oxygen levels plunged, I searched the chart for her wishes in an emergency. Nothing. I explained to her how rapidly her condition had worsened and asked if she’d discussed intubation and mechanical ventilation. She shook her head; she didn’t think it would get so bad so fast. Together we called her husband, who had just left for the evening, but there was no answer. I hesitated. It was as likely as not that she wouldn’t. I explained that we never leave patients intubated longer than necessary, but when people were as sick as she was it was impossible to know when — or even if — they would be extubated. There are, no doubt, differing opinions on what constitutes a good death. But this, inarguably, was not one. For years the medical profession has largely fumbled the question of what we should do when there’s nothing more we can do. A new wave of research sheds light on what patients want at the end of life, and who is — or isn’t — getting it. In their last month alone, half of Medicare patients go to an emergency department, one-third are admitted to an I.C.U., and one-fifth will have surgery — even though 80 percent of patients say they hope to avoid hospitalization and intensive care at the end of life. Medicare spending for patients in the last year of life is six times what it is for other patients, and accounts for a quarter of the total Medicare budget — a proportion that has remained essentially unchanged for the past three decades. It’s not clear all that care improves how long or how well people live. Patients receiving aggressive medical care at the end of life don’t seem to live any longer, and some work suggests a less aggressive approach buys more time. Despite a popular misconception, doctors don’t die much differently: Physicians use hospice care and die in hospitals at rates similar to everyone else. Two interventions have consistently been shown to help patients live their final days in accordance with their wishes: earlier conversations about their goals and greater use of palliative care services, which emphasize symptom control and greater psychological and spiritual well-being — and which recognize that longer survival is only part of what patients want. Patients who engage in advance care planning are less likely to die in the hospital or to receive futile intensive care. Family members have fewer concerns and experience less emotional trauma if they have the opportunity to talk about their loved one’s wishes. And earlier access to palliative care has consistently been linked to fewer symptoms, less distress, better quality of life — and sometimes longer lives. We’ve made significant progress in recent years: The availability of palliative care services has increased 150 percent over the past decade, and compared with patients in other developed countries, older Americans with cancer are now the least likely to die in a hospital (22 percent versus up to 51 percent). But not everyone has benefited from the palliative care movement: Large disparities remain by geography, race and type of illness. Ninety percent of hospitals with more than 300 beds now have a palliative care program, but only 56 percent of smaller hospitals do. Patients treated at for-profit and public safety net hospitals (known for taking in those who have no insurance) are much less likely than those in nonprofit hospitals to have access to palliative care. Many of the palliative care programs that do exist are underfunded and understaffed. And the availability of services remains uneven across the United States: Nearly 90 percent of hospitals in New England have palliative care services compared with about 40 percent in the South. According to the Center to Advance Palliative Care, essentially all hospitals in Vermont, New Hampshire and Montana have a palliative care team, but only a third in Alabama, Arkansas and Mississippi do. It’s also clear that well-documented health disparities for racial and ethnic minorities persist through death. Minority patients are more likely to be hospitalized and receive aggressive care during their last six months, research shows, and are more likely to die in the hospital. They’re also less likely to have access to palliative care or use hospice: Among Medicare patients who die, nearly half of whites use hospice compared with one-third of African-Americans and 28 percent of Asian-Americans, studies show. Family members of African-Americans are generally less satisfied with the quality of care their loved ones receive, and report more concerns about end-of-life communication. Part of this may be cultural. African-Americans tend to have a greater preference for life-sustaining treatments — perhaps due to mistrust of the health system because of prior injustices — and are more willing to exhaust personal finances to extend life. But poorer access to palliative care also probably plays a role, and research suggests that palliative care consultations can increase hospice enrollment and completion of advance directives among minorities. Finally, many seriously ill patients don’t receive the services they need because their diseases aren’t ones we typically think of as terminal (although we should). For example, patients with end-stage renal disease, chronic obstructive pulmonary disease (C.O.P.D.) or congestive heart failure are far less likely than patients with cancer or dementia — diseases we typically associate with the end of life — to receive palliative care consultations. About one-third of patients with renal disease or cardiopulmonary failure die in the I.C.U., while only 13 percent of cancer patients and 9 percent of those with dementia do. Patients with end-stage organ failure are also less likely to receive hospice services, and their families are less satisfied with their care. As a researcher, I find this surprising. As a doctor, less so. When I see patients with advanced C.O.P.D. or kidney failure requiring dialysis, I know they’re sick. But I also know there’s generally something I can do about it — for the moment. The decline of most patients with end-organ failure is punctuated by peaks and valleys. My patient’s heart might be failing and his lungs filling with fluid, but I’ll switch his diuretic medication (it’s just Lasix, not chemo). He’ll breathe better — maybe for weeks, maybe for months — until these intervals become shorter and shorter. It’s unclear exactly when we’re approaching the end, which makes it hard to know when to involve palliative care or start discussions about hospice in earnest. This challenge is, in part, what’s prompting a push to separate palliative care from end-of-life care. Many argue that palliative care, with its focus on symptom control and holistic well-being, should be considered at any stage of a serious illness — not just at the end. Its use should be driven by patient need, not disease prognosis. This conception seems to be consistent with most people’s wishes: The vast majority of patients say they would want palliative care for themselves and their family members if understood as an “extra layer of support” during serious illness. But physicians still tend to conflate palliative care with hospice care, and many don’t feel comfortable engaging in these delicate discussions. Nearly 70 percent say they haven’t been trained to do so, and about half say they often feel unsure of what to say when discussing terminal illness. Talking about death will never be easy, but it is increasingly necessary. As medical technology advances, there will be more and more we can do — but it’s not always clear there’s more we should do. Only through earlier, deeper conversations can we ensure that what we want is what we get. And only by acknowledging our gaps can we ensure everyone, everywhere gets it. ~ by Butch on May 10, 2017.